After ramming each other behind a safety car at the Azerbaijan Grand Prix, Lewis Hamilton and Sebastian Vettel didn’t sleep it off. In fact, no one in the Formula One universe really did. Hamilton wants to settle things outside of the car, and everyone else seems to be freaking out because there was a skirmish. 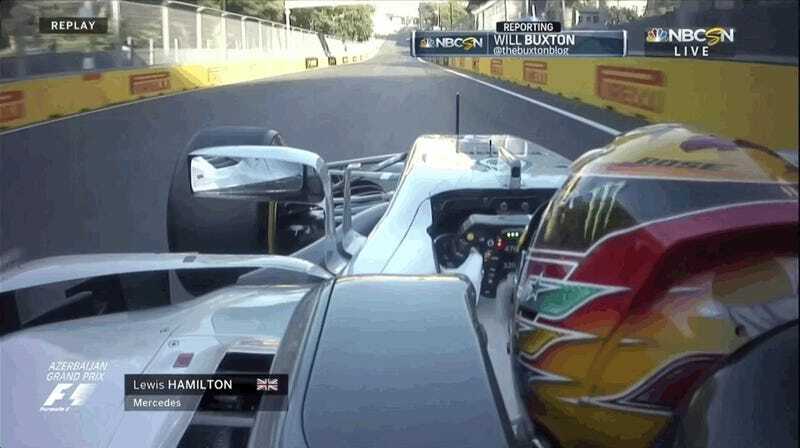 The whole deal started when race leader Hamilton slowed down ahead of Vettel behind the safety car, and Vettel wound up running into the back of his race car. Seemingly mad that Hamilton appeared to brake check him, Vettel drove around the outside of Hamilton and gave him a whack and some hand gestures. Vettel got a 10-second time penalty, and the two wound up barely finishing in the top five. That’s saying something in F1. Hamilton later said he never brake checked Vettel, according to the Guardian. He said as the leader, there would have been no benefit in doing so. 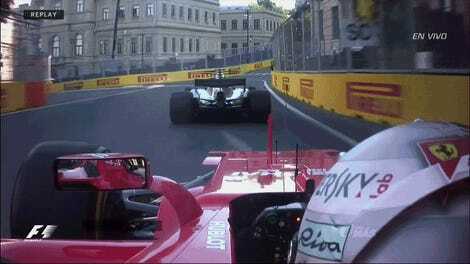 Here’s an example of Vettel’s radio anger from late last year. “Vettel is a decent guy,” Mercedes’ non-executive chairman told reporters after the race. “Normally. This I don’t understand, because he’s crazy. Decent guy, but he’s “totally crazy.” The best ones always are. “Nobody wanted to see the schmoozing anyway, so now the gloves are off,” he said. “The sport needs the rivalry. Yawn. That sounds like a plot from a bad movie with way too many metaphors. But either way, F1 needs a new rivalry to poke fun at since Rosberg packed up and left at the end of 2016. Things have been a bit too smooth sailing—i.e., no hat throwing or shoving each other out of the way—and it’s time to get some real fun rolling again. Let’s just hope no one makes them call and apologize to each other before the next race. Let them fight.